Jason Thompson, the son of Republican senate candidate and former Wisconsin Gov. 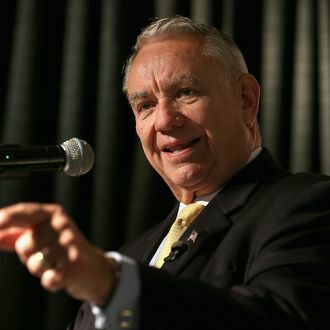 Tommy Thompson, made a pretty crude birther joke at a fund-raiser on Sunday, saying, “we have the opportunity to send President Obama back to Chicago — or to Kenya.” He obviously knows it was an inappropriate crack because on Tuesday Tommy Thompson said Jason “feels terrible about it.” But Thompson the elder also said Jason Thompson wasn’t really even to blame for the remark. He told a group of reporters, “if you look at the movie, he didn’t say it. Somebody in the audience said it and he repeated it, and I’ve talked to him about it and he apologized and that’s it.” Except he did say it. Thompson may have been repeating something from an audience member, but the video makes it pretty clear he relished the joke. Still, Tommy says, Jason is done apologizing. He’s just going to have to feel terrible in private.